In these hard economic times, when parents have a new child on the way, it is often tempting to use a hand-me-down child safety seat or a used child seat purchased from a second hand store but, did you know that child safety seats have expiration dates? It is a little known fact that child safety seats have expiration dates; usually six years from the manufacture date. There is a very good reason for this. Child safety seats are made from synthetic, petroleum based plastics and fabrics. While these materials are excellent for this purpose and make for a very strong and reliable child protective seat, they are subjected to a lot of harmful environmental factors that can weaken them over the years. Most child seats remain in the car and internal temperatures inside the car in the summer can easily reach 130 to 140 degrees and over time, this can lead to a breakdown of the plastic materials. Exposure to the sun is also harmful. Synthetic fabrics, especially nylon don’t tolerate long periods of direct exposure to the sun very well. When exposed to the sun over long periods, the synthetic fabrics can become brittle and break; not something you want a safety belt to do. So, while a used seat may look perfectly fine, there may be damage that is too small to see that can grow over time. Your little passenger is too precious to take that chance. Most seats have the expiration date embossed in the plastic on the bottom of the seat. When considering a used car seat, check the expiration date and make sure that your child will have outgrown it before it expires. Parents should also remember that children who outgrow the child safety seat should graduate into a booster seat until they are at least 4’9” tall. 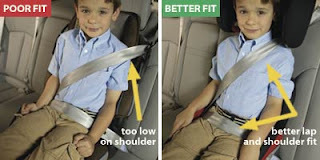 Lots of kids are graduated to seat belts too early and their small frames prevent the seat belt from fitting properly low over their hips. If the belt should rise up over their abdomen, they could be injured in a crash.